The Page of Pentacles is the eleventh card in the suit of Pentacles, and the first ‘face’ or ‘court’ card. A largely positive card, you should expect good things to happen when you see it, especially in any areas concerning long term goals or progression. The Page of Pentacles grounds us in the ‘real world’, so that we can manifest our dreams as tangible goals to achieve. The Page of Pentacles represents opportunity, new beginnings and desire to improve. Past – The Page of Pentacles in the Past position can represent a past event where you were ambitious and concentrated. It could have been a time when you experienced a vision of what you wanted your life to turn out like, and it gave you great motivation. Do you need something like this now? Think back to that past time and try to remember how you felt to further motivate yourself and keep the dream fresh. Present – The Page of Pentacles in the present position means life is fine and well and that things are going to change for the better in the near future. Don’t panic or worry if anything bad has just happened, treat it as a learning experience. You’re turning over a new leaf and there are loftier goals. it’s very likely that currently, you’re relatively happy with certain aspects of your life. Future – The Page of Pentacles in the future position suggests a struggle that you will overcome. It could be that you’re in a tough position right now, but be mindful of the gains that you’ll receive if you just keep up what you’re doing. Work / Education – The Page of Pentacles in regards to work or education is a good sign in most aspects. If your job is boring, especially, you should expect a change coming. It might be a case that you’re just going to have to ‘power through’ the parts you don’t enjoy to see the real benefit. If you can put up with it, it’ll be so much better for you. The Page of Pentacles can strongly represent a new job, as well as the continued learning of a trade or craft. If things are looking tough, keep at I and don’t give up. The apprentice learns and becomes a master only through continued effort. To succeed is to fail more times than others have even tried. Romance – The Page of Pentacles in romance isn’t a great sign. Things might feel stale. Do you want to be single? Do you want a new level of relationship, or a new relationship altogether? Any choice is possible, but you might need to put some effort in. You may even feel like you are trying more than your partner. Many things that happen in a relationship seem like a big deal at the time, but when you really think over it, it’s nothing. Don’t blow things out of proportion. If you are single, then again, you might need to put a lot of effort into yourself to find the right partner. It might be time to consider a new look, or to look for new connections outside of your usual friend group. Friends – The Page of Pentacles in regards to friendship means things might be stagnating. Don’t expect any arguments or gossip now or in the near future, but don’t expect any excitement or anything out of the ordinary to happen. It might be a good time to get into some deep conversations with your friends to discover something new about them, and generally looking to deepen friendships with those whom you are interested with. You might discover some shared interests which you never knew about. Money – The Page of Pentacles in regards to finances is a good sign, depending on your personality. If you’re the sort of person who works hard, then you’ll see the rewards. However, if you tend to let others do the majority of the work, you won’t be rewarded nearly as much as them. It’s not the time to expect any windfalls, so plan ahead instead of waiting for a miracle. You should, in all cases, expect to work hard and be rewarded for the effort you put in. Don’t expect instant gratification, but a much larger payout later on down the line. The way the page is looking at the Pentacle can also represent a coveted item, so you may inherit an heirloom for instance, or come into contact with a precious, valuable item. Health – The Page of Pentacles leans more towards your state of mind than your body. Are you hiding anything, or burying anything deep down? Do you have a lifelong fear? it’s really going to affect your life soon. You’re going to need to face your fear and, for want of better words, get over it. It’ll seem insignificant when you’re done. Spirituality and Mentality – The Page of Pentacles in spirituality means that now might be a good time to help and inspire others. Do you have any skills you can teach? Why not give it a try? Volunteering is also great for your well-being. What do you enjoy? Focus on how you can use your own skills to help others. It’s likely that you are losing focus on whatever goals you are setting yourself. Don’t beat yourself up about it, it happens to us all. One of the best pieces of advice when this happens is to get organised. You might be trying to juggle too many projects, tasks and responsibilities. 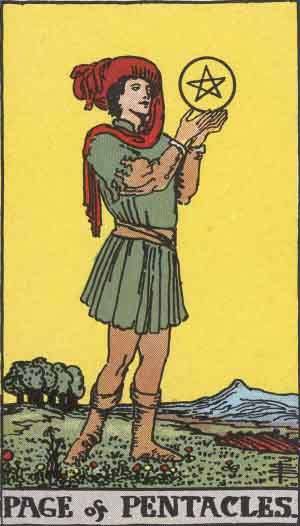 The Page of Pentacles holds one Pentacle in his hands, as you should focus on one thing at a time. Now is a good time to start making lists of things you’d like to achieve, and things which require your attention. Create a list, work through the list, and reward yourself when the list has been completed. We’ve selected live tarot readers to give you a FREE 3 Minute interpretation of The Page of Pentacles! Scroll through them below and pick your favorite one.